Mark Shields said on PBS "NewsHour" last night what a lot of Republicans privately tell us they fear about health reform: "We've just seen the high water mark for this legislation." A top Republican emails me: "I think the reality of the Senate process is setting in." The legislation is likely to take a month or two to wend through the Senate. And Republicans are queasy about getting the likely result back through the House, then to President Trump's desk. "You had the president of the United States and dozens of members of his party there on the lawn, very boisterous, very happy, very jubilant about something that hasn't happened yet. It's one thing for the House to pass; that doesn't make it a law. ... So when he says that Obamacare is dead, Mark Twain would have something to say about that." Atop the N.Y. Times' column 1, "DEMOCRATS FOCUS ON BILL'S STANCE ON PRIOR ILLNESS: HEALTH CARE THIRD RAIL — Looking to 2018, With Stress on Pre-existing Conditions," by Alex Burns and Abby Goodnough: "Groups on the left posted graphics online listing pre-existing conditions that could, in theory, threaten health care coverage, with some shared hundreds of thousands or millions of times." And Republicans have a self-inflicted reason to be defensive. 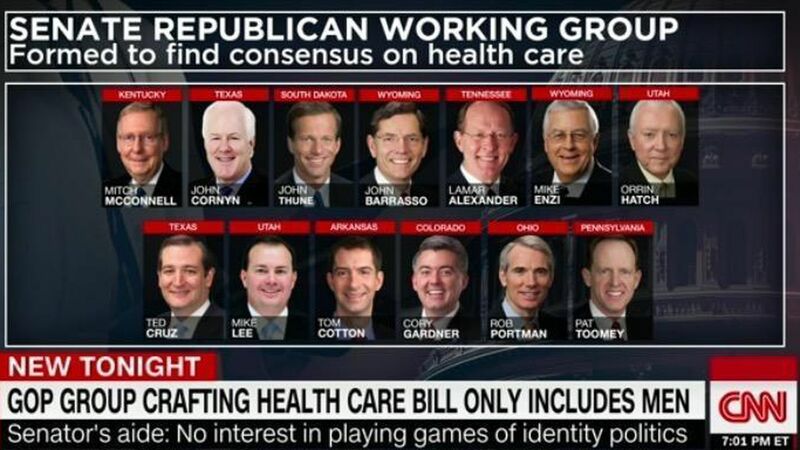 After the white-guy photo from the House ceremony in the Rose Garden, CNN's Erin Burnett pointed out that 13 white men are tackling health care in the Senate: "There are big medical differences between men and women." Drops mic. Axios AM prediction: Susan Collins will be added to the table. The White House fired its chief usher, Angella Reid, the first woman and second African American to hold the position, the WashPost's Ashley Parker and Krissah Thompson scooped: "Reached by phone, Reid declined to comment, saying only, "I think it's best if the White House explains.'" Reid oversaw the residence and events "at the 132-room mansion and its staff of over 90 plumbers, electricians, butlers, cooks and others," AP's Darlene Superville explained. Deputy White House Press Secretary Sarah Huckabee Sanders (who got strong reviews for her on-camera debut as fill-in White House briefer, while Sean Spicer was on Navy Reserve duty) confirmed the departure but wouldn't say why. Reid was great with President Trump and the First Lady, but was considered mean by nearly everyone else, including White House aides and household staff. The workers — who are proud of where they serve and are not paid a lot — did not feel respected. Morale was low. People were in tears on a few occasions. When her departure was announced to the residence staff yesterday morning, workers broke into applause. Reid had been fired the night before and allowed to clean out her belongings when the staff was gone. She received a generous severance package, and the White House will give her a glowing recommendation. History nugget ... "Backstairs at the White House" was the title of a weekend column by the late Helen Thomas, when she — and UPI — were big deals. "As a 1916 billionaire, you would be materially worse off than a 2017 middle-class American; an unhealthy 1916 billionaire would be much worse off than an unhealthy 2017 American of any means. Intellectually, your 1916 range of cultural choices would be paltry compared with today's." Our golden age of humanity: "More than half (52.4 percent) of the 100 million Americans were younger than 25, life expectancy at birth was 54.5 years (today, 78.8) and less than 5 percent of Americans were 65 or older. One in 10 babies died in the first year of life (today, 1 in 168). A large majority of births were not in hospitals (today, less than 1 percent)." I am eager, indeed anxious, to testify in full public session, have requested no immunity and am ready to go. Last-minute intrigue in tomorrow's momentous French presidential election ... "The campaign of ... Emmanuel Macron says it has been the target of a 'massive hacking attack' after a trove of documents was released online," per BBC. Yeah, sure: "The campaign said that genuine files were mixed up with fake ones in order to confuse people." The backdrop: "Opinion polls had indicated the former economy minister carried a lead of 20 percentage points or more over [Marine] Le Pen." CNN: "The files were released just before 2 p.m. ET Friday, around four hours before the election campaign period officially closed with its restrictions on campaigning, reporting and polling," known as the "period of reflection." "Around 14.5 gigabytes of emails, personal and business documents were posted to the text-sharing site Pastebin through links to more than 70,000 files." Jack Barsky, a former KGB spy, tells CNN in an on-set interview that it was probably the Russians: "Who else?" "Feds investigate possible disguising of harassment payout at Fox News," per the WashPost Style section lead story, by Paul Farhi: "Federal prosecutors are looking into whether Fox News Channel and its parent company tried to disguise a $3.15 million payment to Laurie Luhn, a former employee who said she had a 20-year affair with ... Roger Ailes." Why it matters: "The size of the payout is of less concern to the investigation than the manner in which it was accounted for ... Prosecutors are investigating whether Fox News Channel and its parent company, 21st Century Fox, improperly accounted for the payments to Luhn and other ex-employees to minimize their impact on Fox's books." Items up to 4.4 pounds can be shipped [between the U.S. and China] as ePackets, at extremely low rates with tracking numbers and delivery confirmation. ... ePacket's usage has ballooned in recent years. Why it matters: "This ... presents a problem for the stores and retailers accustomed to serving as importers themselves. Brick-and-mortar retailers are already experiencing a grim 2017 ... Cross-border purchases compound the issue: Because of ePacket, and the decades-old international postal agreements that serve as its foundation, lightweight product shipments from China are heavily subsidized by the U.S.P.S." Barron's says "Big Tech" is "Our Favorite Security Blanket" for stocks: "Investors are flocking to tech stocks on worries that the economy may be rolling over. And all are waiting for the new iPhone." Barron's columnist Kopin Tan: "At times like this, investors cling to what they fear could soon become scarce — robust growth." Free link for Axios AM readers. "We think Amazon [now $935] ... could reach $1,000 by summer and $1,100 within a year, for a gain of close to 20%, which, along the way, could make Amazon founder Jeff Bezos the world's wealthiest person." "By the end of the decade, Amazon's profits will balloon ... as revenues overwhelm costs and investments. That's the tricky part for long-term investors. ... The next downturn for Amazon stock might not come when profits disappoint, but when they become too obvious." Olympic marathon champion Eliud Kipchoge crosses the finish line of a marathon race at the Monza Formula One racetrack, Italy. Kipchoge was 26 seconds from making history — just short of becoming the first person to run a marathon in less than two hours. "Kipchoge ran the 26.2 miles in 2 hours and 25 seconds, beating Dennis Kimetto's world record of 2:02:57, but the Kenyan failed to run the first sub-two hour marathon." Run for the Roses ... No clear favorite in Kentucky Derby today (post time: 6:46 p.m.): "Classic Empire is the 4-1 pre-race choice." Talker: "His name is Patch, a horse with one eye, and he'll be running in the Kentucky Derby. How he lost the eye is a mystery. ... [I]f Patch comes up big, he'll be the first Derby winner with one eye." Howard Wolfson, who spotted the link, says "Gimmee Shelter is his #1: "I'm not sure how you really distinguish song 145 from song 217, but there isn't a ton to argue with in their top 50."